Want to look like a dapper aristocrat? Then these are certainly the pants for you. They are a nice deep black and are of excellent quality. I have no doubt that they will hold up for many years to come. In terms of fit, measure your waist with a fabric tape measure and you will be just fine. My pants fit fantastic right out of the box and they feel great. Wore them to a black-tie-optional event and was told numerous time that I was the best dressed in the room! A great Ascot that looks nice and always gets compliments. High quality microfiber and a stunning pattern. My only complaint is that the red dye bled slightly onto my white satin shirt when I wore this to a wedding dance. Be careful wearing with a white shirt it if you are going to get very warm. This vest in incredibly stylish and is a great addition to a formal outfit. Every time I wear it, I get asked when I picked it up. The two sets of buttons is really unique and is a great accent to the vest. The fit is fantastic (measure yourself with a fabric tape) and leaves you plenty of room to move and shake...should you choose to do so. Everything you need in a nice dress shirt can be found here. Excellent construction, style, and simplicity. The fit and finish of the shirt is excellent and my better (in my opinion) than anything you would find at your local mall. A great victorian look and the collar is multi-functional either acting as a short collar or a mild stand-up collar. This monocle, while good looking and nicely priced, is so overly large it is unusable. You *WILL* be disappointed, as I was, upon receiving it. There is no way a normal human can keep this in position without resorting to spirit gum or some other adhesive. Find another one of their fine products, but this should be removed from their offerings. This is such an interesting add-on to any steampunk costume, and the price is certainly right! It worked well with a number of spectacle frames, and I had no problem with it staying securely in place. The only reason I didn't give it 5 stars is that the finish began flaking away from the spring assembly after some typical handling. But for the price, you have to expect some quality issues. Other than that, its a fine addition to my garb closet and I'm very satisfied... you will be too! This helmet makes a fine addition to one's costume wardrobe... it looks just like what you see in the web pictures. My only concern, and reason I didn't give 5 stars, is that it runs small. Fortunately, as the website indicates, the inner headband can be removed and it worn directly on the head... which is most likely how you will end up utilizing this headwear. The chin strap is cheaply made, so leave it in place as a decorative element only. ALso, if you are thinking of attaching any accessories to the strap (I had visions of the 2-lens loupe assembly on the strap) give them up now... the strap is not secure/robust enough to support *ANY* weight. Otherwise, a sharp, clean looking finish to your costume!! I was very excited to recieve this item, it matches my costume perfectly. The style is versitile for historical purposes , and indeed a curvacious enhancement. My husband really enjoyed helping me get in it and also out of it. You will need help to do up the ties as the gusset lining requires adjusting as you tighten the strings. An added asset to my historical role playing. The hat was absolutely perfect. This item was used by my daughter for our local community theater performance. I have purchased several items from Historical Emporium and they have all been fabulous including this vest. The detail, which is a bit hard to see in the picture, is beautiful. As usual I received it really quickly and in excellent condition. I'm never disappointed in their items. This is one of three items purchased for my costume. This shirt is a great period piece and I am very impressed with the craftsmanship and attention to detail. 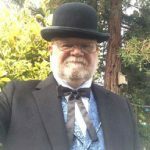 The shirt is very comfortable and is now a vital piece to my western costume at Heartstoppers Haunted House in Rancho Cordova, Ca. I look forward to future business. This is one of three items purchased for my costume. These pants are great!! Super comfortable and they come extra long for proper fit. I wore these for the first time 13 hours straight, on my feet walking for all of about 2 hours. These will never leave my costume. But these are not "costume" clothes. I would feel comfortable in their durability as everyday workwear if you wanted. Thank you. I look forward to future business. What can I say. They're buckled leather suspenders! And they look good. I look forward to future business. One of a kind item unique! The fact that your sites carts are tied together is enough said. But you have very fast shipping in California and it was very easy navigating your sites even on my smartphone. I did all my ordering from it. I was very pleased with the service I received from Gentleman's Emporium. The customer service rep helped me out tremendously with what I was looking for and took the time to help me out with my short deadline. Excellent company to deal with, very good quality products. I have never been disapointed in any thing I've purchased . The clothes are well built and the service was prompt and helpful.